Juliet Saimbi’s own menopause experiences shaped her passion for menopause in the workplace awareness and support. 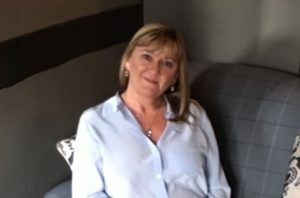 Having lead the awareness and support programme in Severn Trent, supported by Henpicked: Menopause in the Workplace, she’s now part of the Henpicked team. Working at Severn Trent was an exciting and rewarding time. I was always the organised one, highly professional. Upbeat, bubbly, fast working and reliable. But then suddenly the job I’d loved for years became something I dreaded. I’d always found the 100-mile round trip easy. But it all started to become too much. I’d arrive at work sobbing, wondering how I’d made it. Then I’d reapply my make-up and force myself out of the car, nothing like the happy, confident woman I had once been. I didn’t know what was happening to me. It really didn’t occur to me this could be menopause related. But I’d be either crying all the time. Anxiety hit me, terrible panic attacks with my heart feeling it was bursting out of my chest. My memory started to wobble, too. I couldn’t remember the names of people I saw every day and I started to dread people asking me things. The hot flushes were debilitating, I often felt faint. But I learned little tricks, such as buying two of each top so I could change outfits during the day. On a social level, I stopped accepting invitations and pretended I was ill if friends asked me anywhere. By this point, things had become so bad my husband said I couldn’t go on like this. I booked a double appointment with my GP and planned what I was going to say. I had by now realised this was hormonal and I knew I wanted to try HRT. The thought of giving up the job I loved, which seemed my only other option, was too awful. Within about 12 days I felt so different. But it occurred to me I couldn’t be the only one experiencing this. Doing some research, I discovered that a third of our workforce were women and a third of these were 45 and over. I realised so many women were probably feeling like me. So I decided to take positive action. Menopause had always been something to keep quiet about. But I noticed it was finding its way more and more into the mainstream media, and it felt right to introduce it into our workplace. We hosted conferences for over 400 colleagues in 4 months and the feedback was phenomenal. A 100% said the events were excellent and colleagues were confident to talk about menopause. Menopause is normalised in Severn Trent and part of the Leadership Development Programme. The work we started doing in Severn Trent was seen as trailblazing and was recognised in the water industry awards for their programme. We reviewed our internal support guides to include menopause, encouraging more open communication between colleagues and managers. The guides also outlined potential workplace adjustments. Since then, the company has held several more events and launched online menopause resources. I’m so passionate about this that I’ve now left Severn Trent to focus on menopause in the workplace full time with Henpicked: Menopause in the Workplace to deliver training sessions and corporate events. One of my favourite things about my new role is hearing the positive stories. Women who had felt overwhelmed who have found their own path through managing menopause. HRT worked for me, but isn’t for everyone. I’d always advise a woman to visit her GP if she’s suffering from symptoms, to talk over the range of options. My mission to start spreading the word has got off to a flying start, as I was invited on to BBC Breakfast to talk about my experiences. With me was Rachel Suff from the Chartered Institute of Personnel and Development (CIPD). The organisation has just released a new set of guidelines calling on employers to take the menopause seriously, creating a culture where women can ask for support. I want colleagues to leave our events feeling inspired and energised to talk about menopause. Not just at work but with their families and friends too. Let’s dispel the myths, and give people the right information to make informed decisions. Helping people be the very best they can be every day – that’s my ambition and I know we can do it. Juliet has been in learning and development for 20 years in retail and FMCG. Working closely with Henpicked: Menopause in the Workplace she led the company’s move to introducing menopause in the workplace best practice into their guidance. She is now a member of the Henpicked: Menopause in the Workplace team, delivering training and information sessions to organisations.